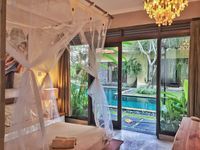 Properties in Gianyar Regency average 4.4 out of 5 stars. Dreamy Treetop Loft in the Rice Fields! Property 1: Dreamy Treetop Loft in the Rice Fields! Private Suite with Amazing Bath Tub! Property 3: Private Suite with Amazing Bath Tub! The Host were very friendly, helpful and we definitely would book this Hotel again.